USDCAD broke above the bearish trend line on the 4-hour chart, suggesting that lengthier consolidation for the downtrend from 1.3467 is underway. Range trading between 1.3286 and 1.3390 would likely be seen in a couple of days. 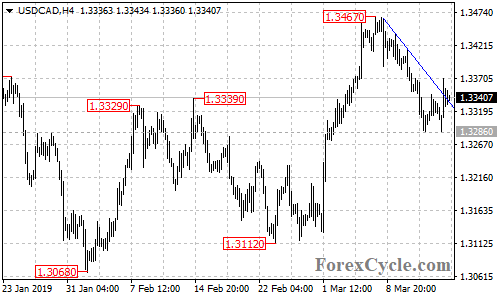 As long as 1.3390 resistance holds, the downtrend could be expected to resume and further decline to 1.3050 area is still possible after the consolidation. Only a break of 1.3390 resistance could trigger another bullish movement towards 1.3600.